You'll be £15.00 closer to your next £10.00 credit when you purchase On Ancient Warfare. What's this? 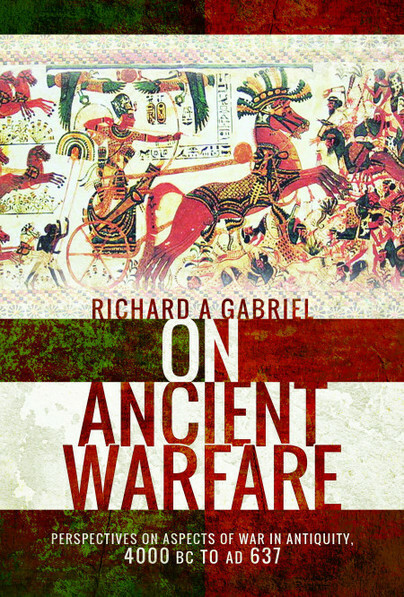 Richard Gabriel has been studying and writing about ancient warfare for nearly half a century. He has written fifty-five books on the subject (before this one) and over three hundred published articles. These decades of scholarship are complemented by direct military experience as a US army officer (now retired). This book presents his thoughts and perspectives on a selection of aspects of ancient warfare that he has found of particular interest over the years. It does not aim to be a comprehensive overview nor a coherent narrative of ancient military history but adds up to an illuminating, fascinating and wide-ranging discussion of various topics. With topics ranging from broad topics such as the origins of war, through logistics, military medicine and psychiatry or the origins of jihad, to specifics such as the generalship of Alexander the Great (Gabriel’s not a fan), Scipio and Hannibal, there is plenty here for the either the general reader or academic scholar. I found that reading it is quite addictive, as at points the descriptions of battles seem like stories. Interesting and very stimulating to read. Rather than attempt to answer the seemingly-impossible task of explaining everything about Ancient Warfare over more than four millennia, Gabriel arranges his book to focus on various aspects of warfare in each chapter. This focus allows the reader to learn in-depth about some of the most fascinating topics of ancient warfare – it meant that when I started a specific chapter, I could not help but want to keep reading until I reached its end... On this Ancient Warfare succeeds in giving us an overview of these ‘forgotten’ areas of war. For any history enthusiasts searching for a unique insight into ancient warfare, Richard Gabriel’s ‘On Ancient Warfare,’ is the book for you this 2019. Despite its limitations regarding the history of ancient Egypt, this is a very thoughtful analysis of the development of warfare in the ancient world. Richard A. Gabriel is a distinguished professor in the Department of History and War Studies at the Royal Military College of Canada and in the Department of Defence Studies at the Canadian Forces College in Toronto. He has also been professor of history and politics at the U.S. Army War College and held the Visiting Chair in Military Ethics at the Marine Corps University. A retired U.S. Army officer living in Manchester, New Hampshire, Gabriel is the author of numerous books and articles on military history and other subjects and a regular 'talking head' on documentaries.